Villa Palazzo del Diavolo is the perfect springboard for exploring the Salento peninsula.In Parabita, in the heart of Salento, there is a special Villa ready to welcome and accommodate you to experience a very special holiday. Villa Palazzo del Diavolo is a historical building of the seventeenth century recently renovated respecting the original characteristics with philological care. A place where the visitor will spend unforgettable days between culture, art and nature, surrounded by history, by the sea and by the cultural and gastronomic traditions of Salento. The many attractions of the Peninsula will be at hand, following routes that will be designed according to your wishes with the assistance of our Tourist Personal Advisor. An experience you can share with all the friends you want. The site can accommodate all in all up to 13 people. 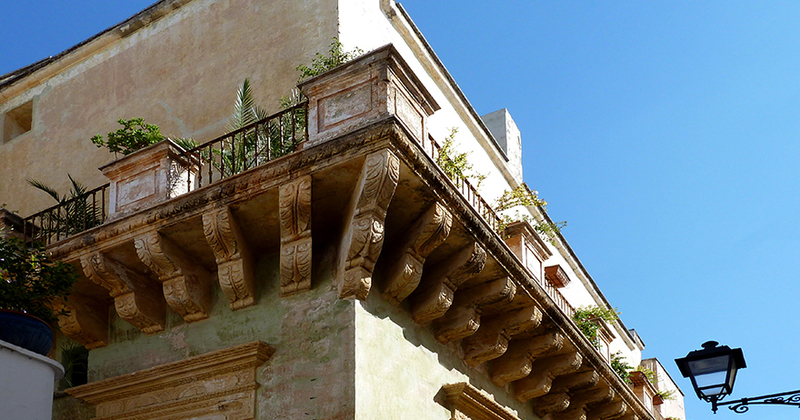 Salento, a miniature Apulian Rajasthan, where events from long ago and more recent trades have left generous traces of prosperity, art, culture, folklore and religion. You have the option to reserve the entire Villa, or an area of the residence or even an independent flat, to live the experience of Salento in a unique, pleasant atmosphere. Any unit has a private bathroom and every comfort (air conditioning and Wi-Fi connection), as well as kitchen and laundry available. “Palazzo del Diavolo” is a perfect place for couples, families or groups of friends who are looking for culture art, folklore and history without giving up the fun and pleasure of the sea of Salento. It includes: 1 large double bedroom with ensuite bathroom and shower, plus 2 twin beds and 1 single bed distributed in 3 large mezzanines, coming up to 7 beds overall; 3 extra bathrooms with shower; laundry; large reception and dining & kitchen room with access to the quaint pantry barn; large living and TV room; terrace and courtyard. Two rooms apartment on the ground floor (large double bed + living&dining room with sofa bed + bathroom with shower). Next door entrance to the cosy ground floor kitchen and to the laundry. Recommended for 2 + 2 people. Mini apartment on the second floor with large double bedroom, ensuite bathroom with shower and large terrace. Private access to the roof terrace located on the 2nd floor. Multifunctional 90sq meter wide vaulted roof tavern connected with open access to the underground cistern. Three bathrooms. The Villa that has always been – along with the Aragonese castle and the Church of St John – a characteristic landmark of Parabita’s historical center, has been enriched by the recent renovation works which have involved local craftsmen and artisans. The same care has been taken in the interior design, seeking contamination and dialogue between old and new, with eighteenth-century prints, unique both historic and modern design pieces of furniture that contribute to the building’s fascinating and evocative atmosphere. The entrance courtyard of the building and the three terraces at different levels are great places to socialize, have breakfast or just relax in the warm evening wind together with friends and the people you like.